To really take in the amazing scale and grandeur of this area you have to experience it from the air. We offer flightsee tours all over the Wrangell-St.Elias region whether it's close to Glennallen or deep in the interior. Come with us to explore millions of acres not accessible by road including three of the tallest mountains of the Wrangell-St. Elias National Park as only possible from a bird's eye view! You will see Mt. Drum(12,010 feet), Mt. Wrangell (14,163 feet),and Mt. Sanford (16,237 feet). Mt. Wrangell is one of the largest active volcanoes in North America. Mt. Sanford towers over 16,200 feet and has a vertical rock wall face of over 9,000 feet. The colors you will see because of the mineral deposits are breathtaking! We will fly over the Nadina and Sanford Glaciers and many beautiful valleys. 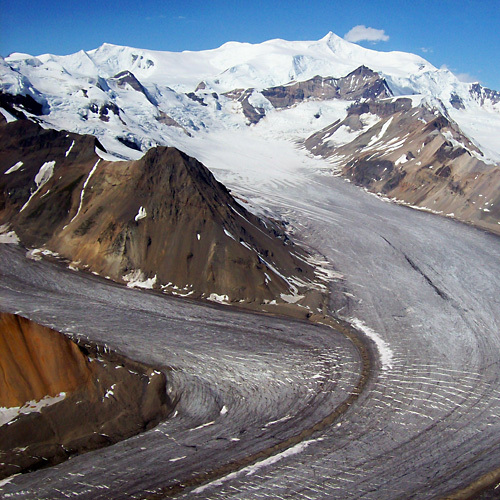 You will see numerous glaciers, pristine valleys, and will fly over the rare and unique mud volcanoes. It is likely you will spot sheep, moose, caribou, bison, and the always popular grizzly bear on this very worthwhile tour. Come visit the nation's largest national park! Copper Valley Air can also arrange for pick-up and air transfers from Anchorage, Valdez, and Fairbanks, Alaska. All of our planes are equipped with passenger and pilot headsets that allow conversation and narration by the pilot during your flight. Our aircraft are high wing which provides a greater viewing experience & all seats are a window seat. $225 per person, minimum two people. Custom tours available.